so glad I found your blog via google search! as a new leader this gives me great ideas! Thank you so much for publishing your blog and your work. I am a first time troop leader and it has help us so much in our planning. The girls chose to change their local world and do a playground clean up at their school and bring awareness to the students to keep the area clean. What an awesome idea. With TAPs don't you have to present a way to make it sustainable. Did you do that, and if so how did you do that? I have been trying to figure out what to do with our TAP but it is difficult to pick something that will be carried forward for years to come. TAPs do not need to be sustainable. You may be confusing them with Shiny Award projects. I'm a third year cadet and we couldn't find a leader for our brownies so my friend and I offered to lead them. To be honest we were lost until we found this blog Thanks so much!!!!!!!!!!!!!!!! You have literally been an answer to my prayers. I am a first year leader and convinced my mom to help. We were so lost. Thank You, Thank You, Thank You. I don't know what we would have done without this. Your ideas were like little seeds to get our ideas flowing. Thank you so much! You have help save a troop in Ohio. 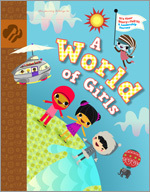 Did you do the World of Girls celebration as part of this journey? Looking for some ideas for ours! I'm going to say "no" to that... this has been 5 years ago... yikes... I feel old now. i don't remember doing the celebration. What resources did you use for country and flag information? What resources did you use for the flags and country info?